Islamabad March 10: Mr. Moazzam Ali Khan Head of Public Relations & Corporate Social Responsibility at Ufone was bestowed with the APNS award of the best Public Relations Officer from the private sector. 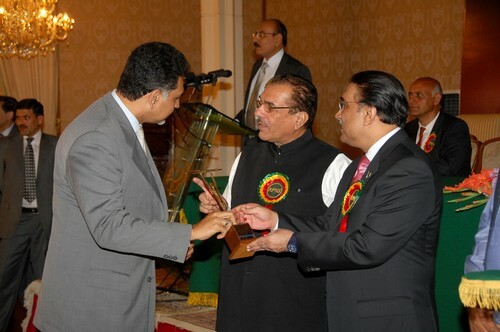 The award was handed over to Mr. Moazzam Ali Khan by President Asif Ali Zardari at the recently held The All Pakistan Newspaper Society (APNS) award ceremony at the presidency. The 19th & 20th APNS awards 2010 paid tribute to all those who are striving for a better tomorrow and also gave credit to all public relations officers in the private and public sector. Federal Minister for Information & Broadcasting Mr. Qamar Zaman Kaira besides the top media bosses and other important government officials were present on the occasion. Mr. Akbar Khan Chief Marketing Officer Ufone said this is a great moment for all of us at Ufone and I am proud to see that our valued employees have stood out as humble and hard working individuals. I would like to take this opportunity to wish Moazzam the very best and this should stand as a precedence and motivation to all other employees at Ufone. Mr. Moazzam Ali Khan Head of Public Relations & Corporate Social Responsibility at Ufone said that I am overwhelmed with the honour that the representative body of print media has given me and I look forward to a growing and strengthening relationship with the media in Pakistan. This is indeed a great honor for both Ufone and myself and I am thankful to all those who have supported my efforts over the years. Over the last two years Ufone has clearly moved ahead with its aggressive achievements and public relations has played a vital role in the buildup and continuous engagement with stakeholders and common public. I would like to thank APNS for bestowing this great honor on me. Ufone is an Etisalat Group Company with its presence in all the major cities of Pakistan along with a comprehensive coverage across all major towns, villages and tehsil headquarters of the country. The company employs more than 3,850 people and operates with a network of more than 375 franchises and 26 company-owned customer service centers along with a distribution network of 150,000 outlets nationwide.